How can I find out of my property is in a Flood Zone? @Roger Bickley After you search for the address, you click view/print or download to get the actual FEMA flood "map image" for the area. Then find your property on the map image and use the legend to determine the flood zone. Wow @ Justin S is a smart guy. Thanks for sharing @Danny Randazzo here's that link again <----------Hot link to take you site Hope it works. @Roger Bickley this is a great resource to see if the property is in a flood zone this is a guide so you can get ahead of your lender who will run a Flood Zone Determination (FZD) before they offer a loan, if the property is in the Special Hazard Flood Area (SHFA) or High-risk area they will require the purchase of flood insurance before you can get the loan. This is due to a law our government has written in 1973ish. I want to answer your exact question about how to decipher the flood map, however, allow me to note that this site is a guide I was helping a client yesterday where this link map said the property is in an X but his lender FZD says it is in an AE I ran an FZD as well and confirmed that 1/2 the property was in the high-risk area. This is why the client is getting flood insurance an calling me. =) All this to say that this link Here (again) is just a guide. One last note then I will answer your question the high-risk flood zones will usually be identified as an A or V and can be represented as (A, AE, AO A1-30 exc.) low to moderate will usually be identified as (X, unshaded X, B, C exc) zones. And if your property is on the beach, bay or great lakes, sometimes very large lakes the V zone which takes into account the Waves these properties may encounter. Now on to your question about how to tell if the property is in the high-risk flood zone. look at the photo I have attached the light blue color symbolizes the high-risk flood zone sometimes you may see an area in orange on this map that is usually the shaded X zone. One word of caution shaded X zones are really a High-risk flood area however typically due to political pressures were removed from the (requirement to carry flood insurance) If your property is in this area you should really consider carrying flood coverage and the good news is the premiums can be much better than the high-risk areas. 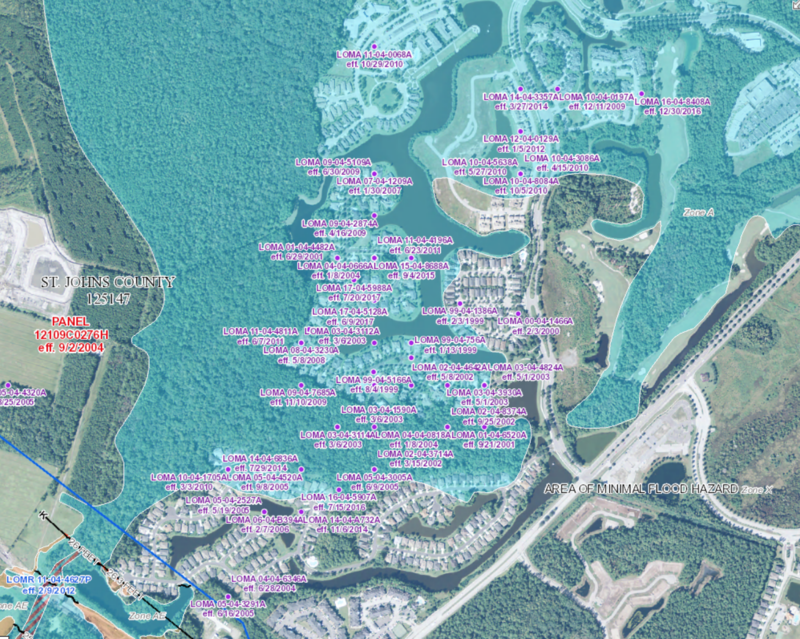 The pink Dots are Letter of Map Amendment (LOMA) which are individual properties that are removed from the high-risk flood zone.